"Nail art does need not a complicated design to be beautiful." Sometimes we are so preoccupied or perhaps pressured to come up with complicated nail designs because we are under the impression that the more detailed the outcome, the better. I, myself have experienced wearing a simple nail art and people who knows me would wonder why I'm wearing so. Maybe they're expecting more since they know I do nail art a lot. But I've realized that we shouldn't be pressured by the expectations of others because simple can be beautiful. Disclosure: This nail art quote is a personal insight. 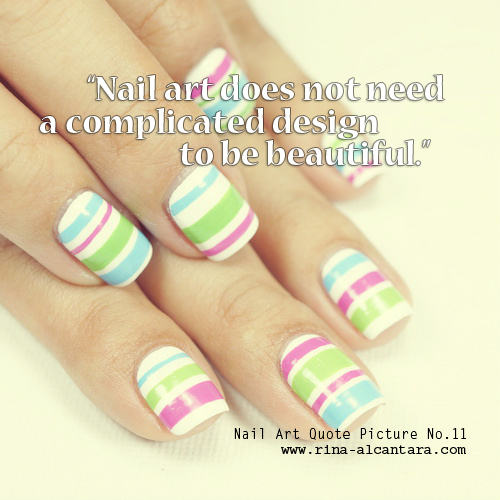 Another great quote and full of nail art wisdom! I can tell I've felt the pressure myself - simple nail art nails equal to a somewhat disappointed face from people who approach me to see my NOTD. Very true! It is kind of overwhelming whenever I browse nail blogs for nail art inspiration. Sometimes I find it hard to remember that there is nothing wrong with simple. Thanks for the reminder!